Our goal with this revamp was to take an item slot that doesn’t get much attention and build more customization around it. Kits were all the extra stuff your character would take on an away mission. Most players picked one Kit and used that for their character’s whole career, never thinking about their Kit abilities again. However, this didn’t really fit the design vision of “take the tool for the job”. To improve upon this, we’ve created a brand new modular system! You get a Kit Frame that contains slots for powers and then equip Kit Modules to choose which powers you want to take with you. New Kit Frames and Modules will be available all throughout the game with the advent of Season 9. Defeated ground enemies will all have a chance to drop Kit items, and Fleet Holding stores will be updated with new-style modular Kits for players to earn. If you’ve already obtained a Fleet Kit under the old system, have no fear - you can trade it in for a new model at no additional cost. White-quality Kit frames and Modules are available for purchase from Energy Credit vendors, while green and blue quality Kit frames and Modules can be obtained via Episode Replay rewards or from the Dilithium Store. All new Kit Frames contain slots for Kit Modules. Each Career has been categorized into one of two Specializations. Science has Research and Medic. Engineering has Fabrication and Mechanic. Tactical has Strategic and Assault. Mark 1 Kit Frames only have a single Module slot, while Mark 12 Kit Frames contain slots for five Modules. Each Kit’s slot layout differs slightly - some lean heavily towards one specialization within a Career, while others take a more balanced approach. Some Kits even contain a rare “dual” slot, allowing e.g. either Research or Medic Modules to be slotted in a Science Module slot. Once a Module has been slotted into a Kit Frame and the frame has been equipped, you gain access to the slotted powers anytime you’re on a ground map. Kit Modules can be slotted and unslotted any time you’re out of combat, at no resource cost. 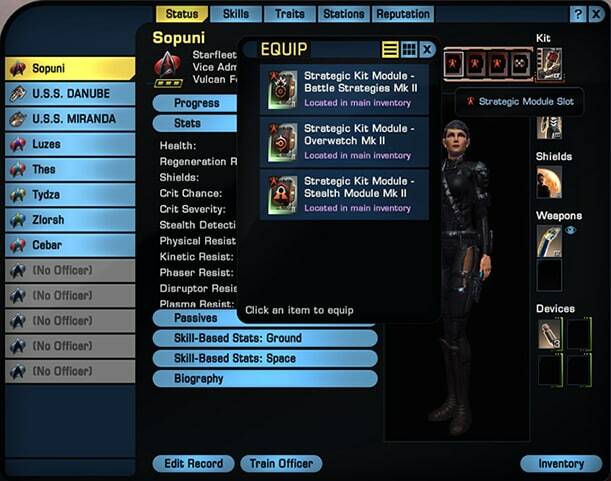 Equipping a new Module invokes a brief cooldown on that Module’s power, preventing old Kit-swapping exploits from carrying over into the new Kit system. It’s important to us that players who prefer the old system can continue playing Star Trek Online in their customary manner. Old Kits will continue to work - if you want to hold on to the Kit you’ve been using all these years, you’re welcome to do so. Eventually, you’ll probably want to move to a new Kit - they have bonuses to class skills on the Kit Frame, and Mark XI and XII frames contain 5 slots for Kit Modules, making them very attractive. One important note about this new slotting system: older Kits rarely contained a full suite of Rank III powers, but new Kits can be filled with all Very Rare (equivalent in power to Rank III) Modules. This means players who participate in the new Kit system will slowly overtake the power level they had reached with previously existing Kits, as they fill out their Modules with better quality powers. The best aspect of the Kit Revamp is it allows the system to be expandable. If we think of a cool new Career power, we can just start dropping Modules for it and let players figure out whether they want to use it. Similarly, if we want to create a new Universal Module for a Featured Episode or reward, we can make a power that any player can choose to slot instead of one of their Career powers. 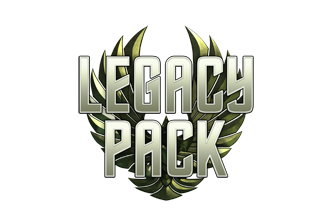 We have many plans for additional expansions to the Kit system, and we hope you’re all looking forward to mixing and matching your powers and optimizing your ability loadouts for your own personal play style. All of the changes to Kits from the systems side had quite a few consequences to how Kits were implemented into the UI as well. No longer would a simple item slot on your character sheet suffice - and with the addition of both Kit frames and Kit Modules, a whole new visual language was needed to differentiate all these new item types from old preexisting Kit items. Since the old types of Kits are remaining in the game, it was important to make sure the new “Kit frame” items we’re introducing have new icons to differentiate them from the old style Kits. As always, we wanted the visual style of these item icons to feel familiar to Star Trek fans and be easily recognizable for their type; looking at the item icon will tell you at a glance if it is a Kit frame (the border around it shows how many Module slots the frame has) and the shape and color of the item in the icon will tell you what kind of Kit it is: Science, Engineering or Tactical. Even more specifically, the item icon will tell you at a glance if the Kit leans more towards one of the specializations within the careers or if it has a more balanced assortment of Module slots. With the Kit Frames, we’re introducing new Kit Modules that you slot to activate your ground combat powers. The icons for these Modules show the type of Module slot the item goes into, the icon of the power that Module grants you, the rarity of the Module item and finally the item’s mark. Module items are color-coded with their slots for their career and specialization. Each specialization also has a distinguishing symbol that appears in both the Module slot on the Kit and in the upper-left hand corner of the Module’s item icon. The specialization of a Module slot or Module item is also listed in the item’s tooltip with the icon next to it for reference. Some Module slots accept Modules from both specializations within a career, and those slots use both specialization icons together. As stated before, the new Kit frames work a little differently than old Kits. To get your ground powers, you need to actively choose which Kit Modules you’d like to slot into your frame. You can do this a couple ways with the new Kit UI. First off, slot your Kit frame into the Kit slot on your character sheet (double click the Kit frame item, drag it into the Kit slot on your character sheet, or click on the empty Kit slot to bring up the Quick Equip list of all available Kit frames). You’ll see a new set of slots appear next to the Kit. 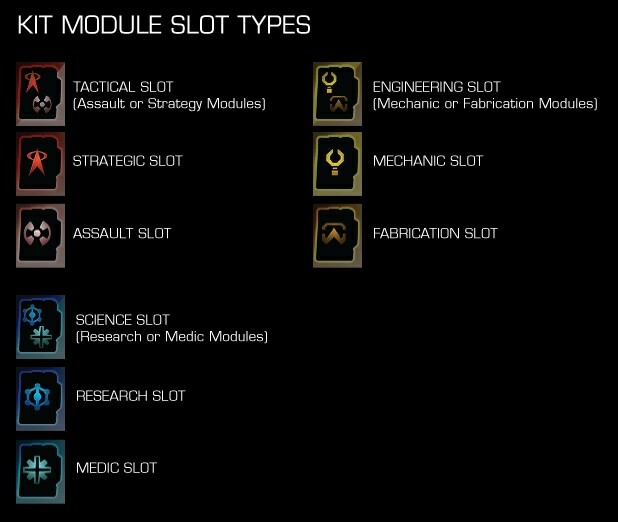 These are the Module slots. The icon in the slot tells you what type(s) of Kit Modules can go there. To add a Module to your Kit frame, simply double click it in the inventory and if you have an appropriate slot available it will be equipped just like a normal item. Additionally, you can drag and drop a Kit Module to a matching slot as you would any other item. Finally, you can just click on the slot itself and use the Quick Equip feature to easily pick from a list of valid Kit Modules. As you can see, the behavior of slotting Kit Modules into Kit frames is nearly identical to how you slot almost every other item on your character or starship. We hope this ease of use, along with the new customization options Kits offer, will provide a seamless transition into an exciting new set of gameplay options for ground combat in Star Trek Online.